WAY Modern Chinois, a unique, classy avant-garde modern cuisine restaurant specializing in contemporary Chinese / Asian cuisine located in Clearwater Damansara Heights. The previous time I dined here, it left a lasting impression. I was there again recently to savour their dim sum menu, so do check out what we had below. Since my last visit here, WAY Modern Chinois has recently added a Michelin star chef from the USA to their team. They are currently experimenting on molecular cooking techniques to provide an unforgettable dining experience for their customers. Shown in the first picture above is their very unique Skinless Shanghai Soup Dumpling going for RM6 per piece. A transparent dim sum, which involves freezing the stuffing with the soup before allowing it to set in, some deep science stuff. Nevetheless I loved how the skinless Xiao Long Bao (XLB) literally pops in your mouth, without the usual skin dough. At the end of the spoon is the vinegar in bubble form. Luxurious chopped truffles is used in the Truffle Crab Soup Dumpling which comes in a basket of four. The colour of the dumpling is black, which is attributed to the squid ink used. Stuffed with crab meat and chopped truffles, it actually tastes pretty good. The Crab Roe Dumpling came served looking really orangey, the colour coming from pumpkins used to make the dumpling skin. On the top, there's this crispy black 'net' made from squid ink, which serves more than to decorate the dish as it enhanced the flavour of the meat inside. Loaded with Japanese crab claw meat, pawns and coriander to add to the flavour, the Crab Claw Dumpling is indeed a pleasure to have. The almost translucent skin makes for a good chinese dim sum dumpling. Be sure to have it while its hot. A modern take on the tradisional Fish & Chips dish, the one served on Way Modern Chinois' dim sum menu is indeed very different. Found inside the crispy outer layer, we have a mix of fried potatoes and sea perch with some black vinegar powder. One of the very tasty and fragrant dish that we had that afternoon was their Wok Fried Cheong Fun with Original Spice Paste. The chee cheong fun is first pan fried till fragrant and then some dried shrimp paste with chilies is added together. Unlike your usual chee cheong fun, here the its really tasty with the shrimp paste and chilies bringing out the flavours. Good stuff. A dumpling strictly made for those who love to eat lamb meat, as the taste is rather strong. The Sticky Rice Lamb Siew Mai is coated with sticky glutinous rice, inside we have the minced lamb meat lumped together with Chinese celery. Love their Char Siew Baos, with fragrant yummy chicken and coriander stuffing inside. A unique way to have your daily dose of corianders, I'm more into the meat rather than all these fluff added in. An all-time favourite of mine whenever I dine at any chinese restaurant for dim sum would be the Crispy Bean Curd Skin Roll. I just love how the crispy outer layer is made to crumble in the mouth without being too oily. The bean curd skin is wrapped with prawns and cheddar cheese stuffings. The Crispy Dumpling with Wasabi Mayo is shaped like a Chinese money pouch. Stuffed with chicken and chives, the wasabi mayo which is served along with it thankfully isn't strong enough to overpower the taste of the stuffings. Instead, the two ingredients complements each other well. As with most dim sum dining, if you are not filled up yet at the end, then go for the rice. At Way Modern Chinois, their Lotus Leaf steamed sticky rice comes with duck, which really fills your tummy up. 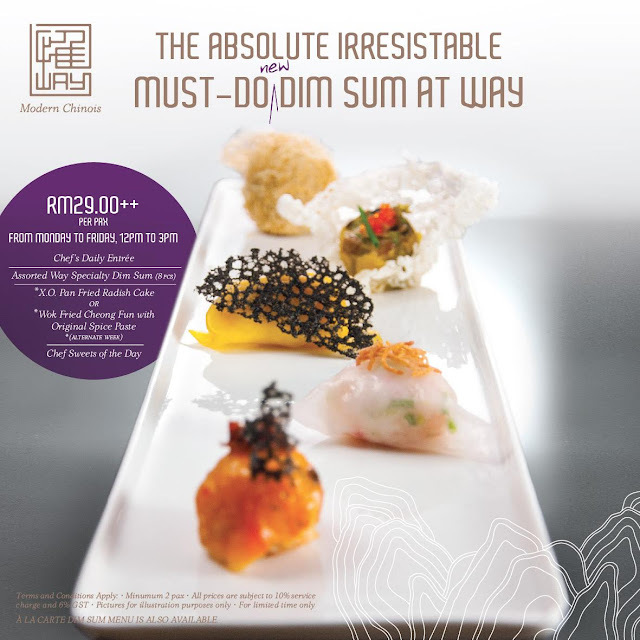 Do check out their Dim Sum Menu @ WAY Modern Chinois Restaurant the next time you're in the vicinity of Damansara Heights. Some look really good but at those prices, I think I'd just settle for the not-so-nice regular ones. Sobsssss!!! !